Challenge up to four friends, enjoy fast arcade action, try your hand at crazy race modes and unlock new tracks and cars in this 3D Pixel Racing Demo. Turn on your headlights and experience the thrill of the night race. Select your favourite car and get ready to burst in the first worldwide 3D Pixel championships. Master Higgins is back – help him search through uncharted islands for the missing princess Tina. Grab a skateboard and dash across savage lands filled with spiders, cobras, skeletons and more. Crack open monster eggs to free your dinosaur buddies – they’ll give you a wild ride. Furry Legends is a fantasy adventure game based on the original WiiWare game. The environment and puzzles in Furry Legends are driven by real-time physics, featuring moving bridges, falling stones, rotating elevators, and much more. In the Furry Legends world, everything is a bit crazy. Compose whole songs and create rhythmical and melodic themes in Rytmik Retrobits. 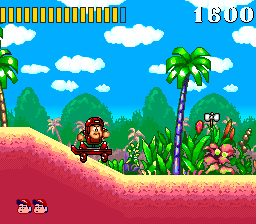 The game contains more than 180 carefully selected authentic and retro sound samples, ranging from percussion, bass, melodic instruments and the effects from 8-bit and 16-bit computers and classic consoles. Turn your console into a powerful pocket music station – you’ll be king of the retro party in no time.